One of the most important things I learned from using the I-Ching for years was that life is constantly changing. If you think of it like a river that never stops flowing, but may trickle into a new tributary for a short while, then withdraw from that and find another, ever searching for new ways to manifest. That is what the source energy of our lives does as well. 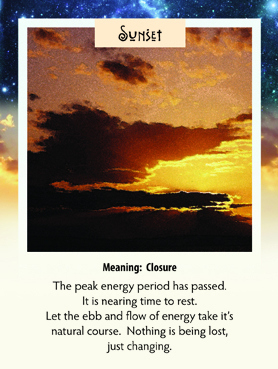 So this week, look for something to “sunset” out, but at the same time, look for the new area for that energy to manifest. If nothing every changed, we will still be living in caves. Instead, we are moving forward at a remarkable pace right now. Exciting isn’t it! Enjoy your week!